Mervyn Bishop was born 1945 at Brewarrina, NSW. He developed a keen interest in photography as a youth, and in 1963 successfully applied for a cadetship at the ‘Sydney Morning Herald’. In 1971 he was named press photographer of the year and in 1974 Bishop began as staff photographer at the Department of Aboriginal Affairs, Canberra, covering major developments in Aboriginal communities. Since 1986 Bishop has worked as a freelance photographer. Throughout his career, Bishop has produced work that has recorded an Australian history recognising the contribution of Aboriginal people. This is reflected in Bishop’s portraits, such as ‘Lois O’Donoghue CBA, AM and Oodgeroo Noonuccal’ 1974. Lowitja ‘Lois’ O’Donoghue and Oodgeroo Noonuccal are important figures in Indigenous history. O’Donoghue has held a number of positions working for Aboriginal and Torres Strait Islander people. In 1967, she joined the Department of Aboriginal Affairs and in 1975 became the director of the South Australian region. She was chair of the Aboriginal Development Commission 1989-90, and founding chair of the Aboriginal and Torres Strait Islander Commission 1990-1996. She was the first Aboriginal woman to be awarded an Order of Australia, has been honoured with a CBE and was made Australian of the Year in 1984. 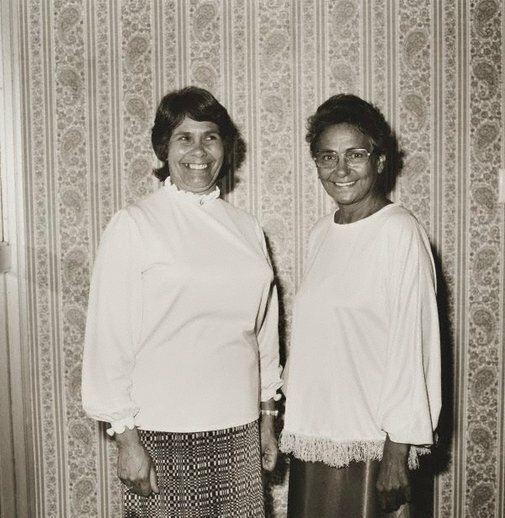 Noonuccal was a poet, educator and political activist, fighting for equal opportunities and citizenship for Aboriginal and Torres Strait Islanders throughout her career. She was Queensland state secretary of the Federal Council for the Advancement of Aboriginal and Torres Strait Islanders and was involved with many Aboriginal rights organisations. Noonuccal played an important role in bringing about the 1967 referendum, fighting for Aboriginal people to be included in the Australian census. In photographing these women, Bishop is countering the history of representation of Indigenous people. These are powerful figures with impressive careers, and the respectful depiction of O’Donoghue and Noonuccal invites the viewer to connect with the subjects as people, and creates an image of empowerment.